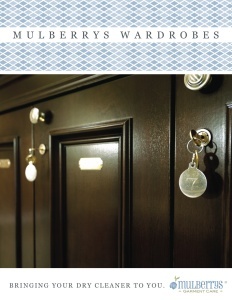 Introducing MULBERRYS WARDROBES, the next evolution in artisan dry cleaning & laundry! We are pleased to announce that we now offer dry cleaning wardrobe services for your ultimate convenience. For customers in condominiums and high-rise residences, the Mulberrys Wardrobes service allows you to experience our pickup and delivery service without either a need for a community storage area or on-site assistance from your front desk personnel. 1) Residents place their clothing in the wardrobe. 2) A Mulberrys delivery representative will pick up the resident’s clothing and drop it off cleaned, pressed, and looking immaculate on the next delivery day. 3) Residents receive a text that their order is ready for pickup with a special code to unlock their personal wardrobe. We look forward to serving you with pleasure.